It is the safest of safe bets that Emmanuel Macron will be the next President of France. The same French polls that accurately predicted today’s outcome to within one percentage point – right down to detecting Marine Le Pen’s slight fade in the final few days – currently have Macron 26 points ahead of Le Pen in the run-off election due on May 7. Not even the best effort of the Islamic State – who carried out a terrorist attack on the Champs Elysee to try and stampede voters towards Le Pen – did her much good. For his part, Macron is shaping as the third major test case, after Bill Clinton, after Tony Blair – on whether the aim of ‘progressive social policy’ and realities of ‘neo-liberal economic settings’ can be made to credibly co-exist within the same sentence, let alone within the decrees from the Elysee Palace. Marine Le Pen of the far-right Front National (FN) promises to abolish automatic citizenship for those born in France (jus soli, right of the soil), take France out of the Schengen area, introduce preferential treatment for French citizens, and deport irregular immigrants. Despite the high levels of voter cynicism and discontent, this plainly wasn’t widely seen by French voters to be a desirable or credible set of solutions. For now, French voters from the traditional political parties of the left and the right are still of a mind to unite against Le Pen’s programme of xenophobic nationalism. That’s been one of the more interesting takes from yesterday’s result. As the US pollster Nate Silver has pointed out, nationalist parties in Europe have not performed very well at all since Donald Trump supposedly ushered in a new political era of nationalist populism. If anything, Trumpism could be serving as a warning to be careful about what you wish for. The limited support for xenophobic nationalist parties has been well captured by Silver in this chart. Such parties can and do appeal to sizeable blocs of the discontented, yet the rural/regional armies of the dispossessed are not proving to be the irresistible tidal wave rolling up over the cosmopolitan elites that Trump aides (such as Steve Bannon) had hoped for and predicted. No doubt, Le Pen and her supporters will be optimistically treating Macron as a stepping stone to ultimate victory in five years time. Much more polarisation and social disenchantment will have to occur before that becomes a viable political option. If the inexperienced Macron fails, the traditional parties under fresh leadership are just as likely to be the prime beneficiaries. Macron’s current popularity… risks propelling to the top job the heir to a President of record unpopularity. Hollande has said: ‘Emmanuel Macron, c’est moi. He knows what he owes me.’ Macron certainly isn’t a socialist, but then neither is Hollande. [Macron advocates] a new social alliance between the educated middle class and neo-liberal bosses, joined by their desire to spread out in a global market. He speaks of entrepreneurship, not welfare dependence; profit rather than unearned income; reformers and modernisers against extremists and conservatives….Following him would mean pursuing that neoliberal-progressive ‘third way’ that beguiled the US Democratic Party and European social democrats even more than Hollande, and then brought them to their current dead end. To top that off, there is Macron’s oft-declared enthusiasm for the European Union, in its current German-centric form. (No wonder Angela Merkel has already expressed her delight at Macron’s victory.) On the other hand, Macron is no fool – and he has Hollande’s failure as a clear warning against taking the road of mere compliance with the EU status quo. 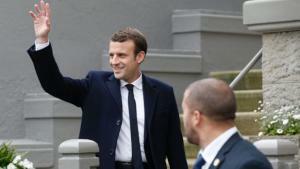 The immediate task that Macron will face after formal victory on May 7 will be the parliamentary elections set tonfollow in June. His En Marche (Forward) party has to build a regional machine from scratch, nationwide, to give him any chance of winning enough deputies (or sympathisers) to enable his legislative programme to be passed. Even if voters are generous and do install a sizeable slate of his followers, this alone will not guarantee him success, downstream. It is pretty chastening to recall that in 2012, Hollande had inherited an amazing concentration of power domestically within France, and an EU whose membership was eagerly looking to France to lead a rebellion against German hegemony. In June 2012 [a month after Hollande assumed presidential powers ] the [Socialists] for the first time had effective control of the presidency, the government, the National Assembly, the Senate, 21 out of 22 metropolitan regions, 56 of 96 departments, and 27 of 39 cities with over 100,000 inhabitants. I want to be the president of all the French people – of patriots in the face of the nationalists’ threat. A president who protects, transforms, and builds, who allows those who want to create, innovate, do business, and work to do so more easily and more quickly. A president who helps those who have less, who are more fragile. I will work over the coming fortnight so that together we can gather as many people as possible around my candidacy. The strength of this coming together will be decisive for government. The challenge this evening is not to vote against a person, but to decide to break completely with a system that has been incapable of responding to our country’s problems for 30 years. In an interview with the protestant weekly Réforme, Macron… said: ‘Immigration is actually a good thing from an economic, cultural and social viewpoint’. Yet this position is absent from his presidential manifesto, which talks mainly of [supporting] the right of asylum — which right wing parties promise to be tougher on, though not abolish — and of repatriating failed asylum seekers ‘without delay’. Over the next fortnight, Le Pen will be keen to sharpen up what immigration policies Macron actually aims to pursue, after May 7.